that is far beyond the ordinary. It’s about music and softball, dreams and passion, courage and loyalty and mysticism. The characters are eccentric and dynamic, as is the Ocean Beach, California community in which they live. Even the language is multi-layered, mixing music, sport and street talk with soaring imagery. Seven of “Andy’s” songs are added as a special gift at the end of this truly remarkable work." 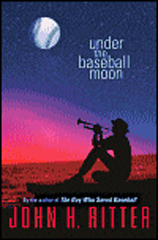 Lesson plans for Under the Baseball Moon contributed by author and educator, Susan Vreeland! "Top 10 Sports Books for Youth"
"Some people play music by ear, but, me, I'd rather use my eyes. What I mean is, I'd skate along easy, cool, watching the street scene roll by. But I'd be scoping, scanning for rhythms, for a crow's hop, a dog's walk, slipping in eight, nine notes in a four-beat measure. I'd get in sync or syncopate, whatever it takes. "I'd be like a tagger, a spray-paint artist, like some muralist. I'd spray music out my horn, and it would cover people, cars, birds, buses, bikers, dogs, and trashcan cats—anything that caught my eye—as I skated on by, cool and easy." Order Under the Baseball Moon here.